The acid test of the book is that I refer to it often, but it has a personality all of its own and if there is any proof I can offer of the Ultimate Collector's Guide having stood the test of time, it is that a copy sits only a few feet from my desk. 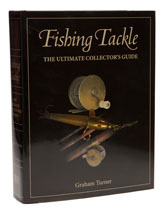 As far as the coverage of classic tackle goes, this book has no rivals in terms of the sheer amount of territory it covers; but inevitably there are some gaps. To cite a couple of examples, you will search the index for Mitchell in vain, and the history of the reel in America has been rewritten around the assumption that Ustonson was exporting sophisticated multipliers during the late eighteenth century, a claim with which it is fair to say there is a great deal of disagreement. The flip side of the coin is that, given the mind-boggling task of covering this enormous subject, the author has done a better job than anyone else - most of Graham's critics, to their shame, do no more with their preciously guarded knowledge than criticise. If any of them had written a book of this standing, I would be more likely to listen to their opinions, but they have not. The Ultimate Collector’s Guide is a great appealing shaggy dog of a thing; and although the chapters on angling history are best described as idiosyncratic, it retains the indomitable spirit of its predecessor, doubles its scope and is vastly improved in terms of layout and presentation. The standard of the photography is much better than before and the plates range from acceptable to very good with the result that the book can truly can be said to be "ultimate"; no other work of its type even dates to approach its scope. Although it cannot be denied that the competition has caught up and many areas are covered in more detail now by specialised monographs, for example John Drewett’s monograph on Hardy reels; Elwyn Attwood’s book on J.W. Young; and the Whitefish Press book on the Mitchell 300 to name but three. However, if you want a single reference source collectible fishing tackle there isn't a better game in town, full stop. So, if you want a quick reference to check dates, or just want to know what a reel looked like, this is as near to a one-stop shop as you are ever going to get. Like I say, I use it a lot and so will you. If you are a collector, then you ought to own it.